How to recognize partners with narcissism, anti social, sociopathic or psychopathic disorders. How to leave, heal, and build a sound recovery. 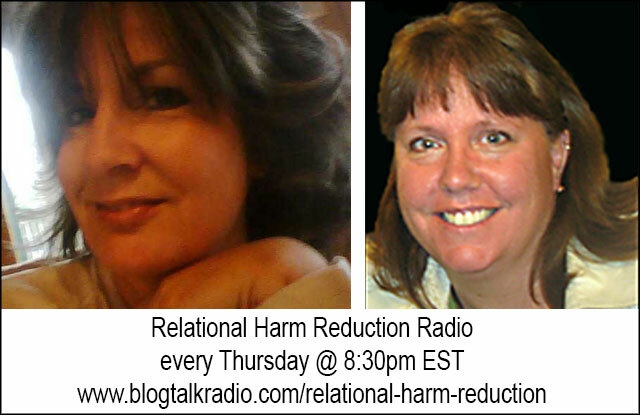 Sandra L. Brown, MA and Jennifer Young, LMHC are the hosts of Relational Harm Reduction Radio each Thursday at 8:30pm ET on BlogTalk Radio for the purpose of educating the public and professionals about the pathology of harmful love relationships and how to assist in leaving healing and recovering. It’s a process based on the models created by The Institute for Relational Harm Reduction and Public Pathology Education. This week’s show features Barry Goldstein discussing the broken family court system and the impact it has on high risk custody cases. For more information about the new book, including access to the first approximately 50 pages or to purchase the book go to the publisher’s web site at http://civicresearchinstitute.com/rdv.html Everyone is welcome to share this information. Previous PostChange Already! with Jillian Maas Backman: Non-Profit and the Arts, Sam Bass Community Theatre is a Winner!